Today the 1926 nickel value begins at $0.72. The price is for a heavily worn coin, in what is known as "Good" condition. 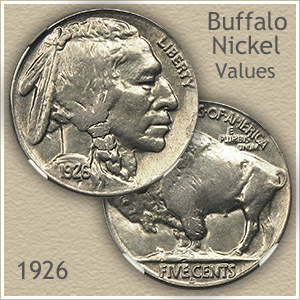 However the branch mint issues of the 1926 Buffalo nickel are rather elusive, any you find has great value. These old nickels were minted at three different locations, each valued separately, with the San Francisco mint coin as the standout piece. Next, the amount of wear and abuse your coin has endured plays an important role in the 1926 nickel value. Examine each carefully, how well the coin has survived determines how much it is worth. The "uncirculated" example pictured, because of its excellent quality, is high on the want lists of collectors and rare coin dealers. 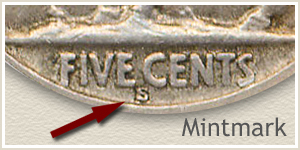 With the strong 1926 nickel value of the branch mints, finding one is a potential treasure in your box of old coins. Of the three mints that produced Buffalo nickels, the 1926 "S" is the one you are hoping to find. The small "S" located on the reverse indicates the coin was minted in San Francisco. The next in value is the Denver mint coin identified by a "D". And third place in value, the Philadelphia mint, did not use a mintmark. The 1926-S Buffalo nickel with a very low original mintage of 970,000 coins has from the beginning been one of the more elusive dates in the series. Finding one of these rare nickels in worn, circulated condition is a prize worth $15 or more. Finding one in suburb "uncirculated", still in brand new condition is discovering a treasure worth $2,600 to $3,000. So few of the 1926-S nickels have survived in Uncirculated condition and the demand from collectors has pushed the value into the thousands of dollars. How high can the price for one of these rare coins go? Recently at a David Lawrence Rare Coin Auction $17,250 was required to be the winning bidder on a very choice 1926-S Buffalo nickel. A truly outstanding coin, this nickel radiated quality through the soft toning and further adding to its appeal are the abrasion free surfaces of a well struck coin. 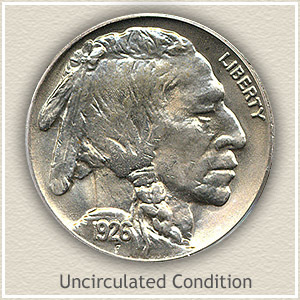 Serious collectors assembling the finest Buffalo nickel collections are willing to aggressively bid on the right coins. The 1926 nickel is one coin to carefully examine before an accurate value is determined or to receive full price if selling your coins. 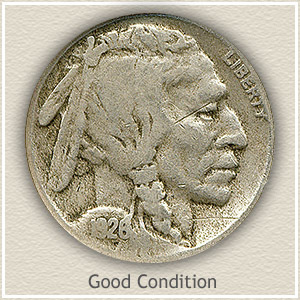 The second half of your value investigation is judging the condition of your buffalo nickel and determine its grade. As seen in the chart above a difference in "Grade" produces a large swing in the 1926 nickel value. 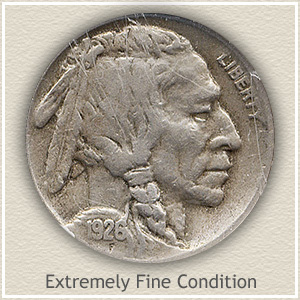 Uncirculated: A 1926 buffalo nickel in this condition stands out as a superior coin. It never circulated, therefore its surfaces show no signs of wear. Handle "Uncirculated" condition coins by their edges to preserve their surfaces. Rotate the coin under a light, examine the cheek of the Indian and upper back of the buffalo for signs of wear, appearing as dullness on the high points. 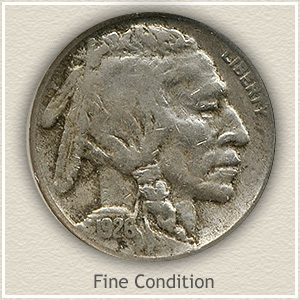 Extremely Fine: As a coin circulates friction begins to show as a slight loss of detail on the hair braid of the Indian and upper front leg of the Buffalo. Although wear is noticeable your nickel still appears sharp and crisp, and a desirable coin. Fine: Once well rounded features are flattened in appearance. Places to study are the Indian's eyebrow, chin, and hair above the braid. Smooth spots have been created on the Buffalo's upper and lower legs, head and body, although a separation from one area to the next remains. The branch mint "D" and "S" Buffalos are nice collectibles in this grade. Good: Buffalo nickels have such a bold design that even in Good condition they are pleasing. The rim however has begun to touch the tops of the lettering on both the obverse and reverse and the date is faint but readable. Check all your buffalo nickel values on the chart. Rising prices, caused by increasing demand from both collectors and rare coin dealers requires a second look at your now more valuable coins. Including more relating to your 1926 nickel value. These early date Buffalo nickels are becoming valuable. Easily find how much your old coins are worth. Covering the Nickel series from Shield nickels, Liberty, Buffalo and Jefferson nickels. All include value charts, along side grading images to find the accurate value of your old nickels. Coin Values Discovery... finds the 1926 nickel value and... all old US coin values. It links to all coin series, from Cents to Gold. Value charts, images to judge the all important condition of coins, and a guide to getting the best deal if selling coins.